As a coach you don’t have to rely on the traditional one-to-one coaching to make a living. You can also offer other products and services at varying price levels to your prospective clients. 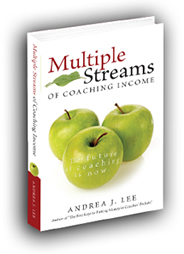 The “Multiple Streams of Coaching Income” book by Andrea Lee outlines the ways coaches can do this. Andrea J. Lee has a mission. “To put money into the pockets of 10,000 coaches by 2008.” Her book Multiple Streams of Coaching Income can certainly help coaches do just that. Andrea covers the entire spectrum of making money as a coach. The mindset needed. Finding a niche. At least 3-5 pages on each of the 13 possible income streams. It complements “Chapter 9: 18 Additional Ways to Make Money as a Coach” of the How to Become a Coach ebook. You have that in your digital library, right? This entry was posted in Building a Business and tagged Andrea J Lee, making a living, Multiple Streams of Coaching Income on August 15, 2007 by Become a Coach Team.